The Retro Era is characterized by its primitive appearance and lack of spell cards. Hey there, wait up a minute! Want to download entire era instead of individually? Click below. While our girls are still recovering after the arrival of the youkai, demons from the realm of Makai now begin trying to invade. Once again, Reimu decides to cut off the invasion at the source. Each for their own reasons, Marisa, Mima, and Yuuka also decide it's in their best interests to investigate. * Being the last PC-98 era game, this title includes all of the tracks from the previous games. All of them, even the unused ones. * Mystic Square includes the Dream mechanic as well, but it functions quite different this time around. The gauge above the Power meter is your Dream gauge, and it can be filled up in many ways, such as collecting a Point item at its maximum value, or grabbing a Dream item, which brings it to Max immediately. It will also gradually increase on its own if enemies are onscreen during a stage portion. Bombing, dying or letting point items fall (only when it isn't full) will decrease the gauge. The higher your Dream is, the lower the Point of Maximum Value will be at. * Reaching Max Dream will erase all bullets, and will make all point items be worth a lot more, anywhere on the screen. 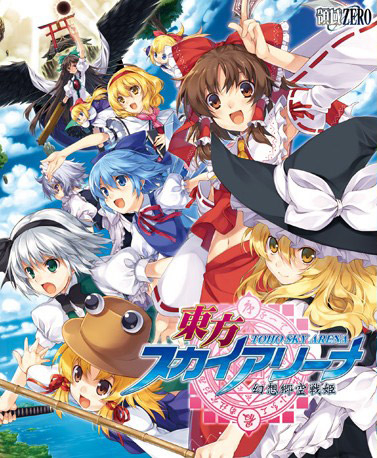 Youkai have once again begun to swarm the Hakurei Shrine, prompting Reimu and Marisa to separately head for a lake in the mountains - the apparent source of a tremendous power surge. The two reach a gateway underneath the lake which transports them to an odd fantasy world - the location of the mansion Mugenkan, where the mastermind supposedly lurks. * This is the first bullet hell game in the series where you can Focus, which will slow you down for easier bullet-dodging (although your hitbox doesn't become visible when doing this as it does later on in the series). * As unbelievable as it may sound, this entry in the series brings with it a Rank system. Basically, the better you play in one run (collect lots of items, gain lives, don't bomb or die), the higher the Rank will be, the harder attacks will become, while dying and scoring little with decrease the Rank. This mechanic disappears after Touhou 7 - Perfect Cherry Blossom. * For all your scoring needs, this game introduces the Dream mechanic. Aside from Power and Point items, the Dream item makes its appearance. These items increase your Dream by a set amount per item, maxing out at 12800. This value is added to the Point item's, so for example, grabbing a Point item at the top of the screen (51200 points) with 12800 Dream will bring the item's value to 64000. Scorefile * It has 25% completion status (Extra is only unlocked for Reimu A). Some odd ruins have appeared a short distance from the Hakurei Shrine. Curious to investigate, our girls arrive almost simultaneously - only to discover that the ruin... doesn't seem to have an entrance. Then they discover an edict laid out: Only one person may enter the ruins, but they will be greatly rewarded. Seeing this, the girls decide to hold a competition, where the last one left standing will be allowed to go in and claim the prize. * This scorefile was provided by GlitchyMissingno. * It has 100% completion status (both Chiyuri and Yumemi are unlocked). After returning from a training session, Reimu finds that her shrine has been overrun by ghosts and youkai! Excited by this chance to test her fledgling abilities, she mounts her flying turtle, Genji, and grabs her exceedingly powerful Yin-Yang Orbs so she can go investigate. * Aside from being the first bullet hell game in the series, this game has another unique functionality: Unlike the rest of the series, bosses don't have health bars in this game. * This was the first game in the series to use the concept of an "Extra" stage. * It has 100% completion status; Extra is available for all shot types. 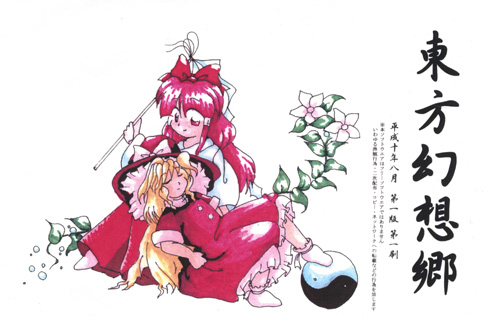 * The screen never scrolls; this is built in the style of breakout games such as "Arkanoid," featuring a large Yin-Yang Orb that Reimu hits around the screen with her techniques. The Yin-Yang Orb and Bombs (under specific situations) are the only things that can damage enemies. However, you can also be crushed by the orb if you let Reimu get hit by it. * Reimu will fire her shot upwards when you hit Z. This shot cannot damage enemies, but it can erase a bullet it hits and change the Yin-Yang Orb's movement when it connects. * She can also use her gohei for similar, more direct purposes when you hit X while standing still. She will swing her gohei back and forth once, her first swing being stronger than her second (her second swing can't deflect bullets either). * Combining movement, Z and X can make her do various other tricks, like a Slide Kick (moving + X), a Flip Kick (Slide + X at the end without pressing left or right (or pressing the opposite direction)), and a Shot Barrage (Slide + Z at the end). * Even the earliest game had a Bomb system, despite how different it is than the rest. You start the game with a single bomb, the amount can't be changed. You can only receive a bomb if Reimu gets hit, but regular tiles can give you a bomb too if you're lucky. To use a bomb, press left, right and Z at the same time, or Z and X twice. Bombs will hit most, if not all, onscreen tiles once, and if the orb comes into contact with Reimu while it is active, the orb will be launched instead. Bombs can only damage bosses if you have no lives left. Scorefile * This scorefile provided by GlitchyMissingno.